With most traders now owning a smartphone of some kind, there is a huge demand for trading platform solutions that allow users to carry out their trading activities on the move. This opens up huge new opportunities for brokers and traders, as independent traders can now keep an eye on the markets – and their accounts – at their convenience. For example, if they were standing in a long queue, or waiting for a train, they could make use of this otherwise dead time to research the markets and keep track of their investments. Also, it means that opportunities can be seized at times when you might not have a computer to hand. 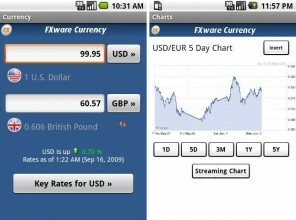 The range of forex trading apps for smartphones, particularly Android and iPhone, is expanding rapidly, but there is a lot of dross out there. Here, we have picked what we feel to be ten of the best smartphone apps for forex traders, kicking off with the mobile version of the most popular online trading platform, MT4. Although it has been a long time coming, the mobile version of Metatrader 4 has been well worth the wait, offering users of the ubiquitous multi-broker trading platform the opportunity to manage their trade accounts wherever they are. As you might imagine, the functionality is a little slimmed down from the more comprehensive desktop software, so there’s no MQL programming, but it remains one of the most fully-featured mobile trading platforms. It includes 30 of the most useful technical indicators, trading history, advanced charting, ad the ability to execute a full range of trade orders on the move. Keeping on top of the latest news, headlines, and opinion pieces from the world of finance is vital for any forex trader, especially when they are on the move. While there are a number of apps that offer this service, Bloomberg’s smartphone app is by far the best, as it offers real-time breaking news and data specific to the forex market, including price charts, stock quotes, market trends analysis and a range of other basic tools. FXCM’s Trading Station has long been considered one of the most fully-featured proprietary desktop trading apps, and the mobile version more than lives up to this heritage. It provides live executable exchange rates for over 56 currency pairs, the ability to monitor your account balance, equity, and margin in real time, and a comprehensive range of basic and advanced trade orders. 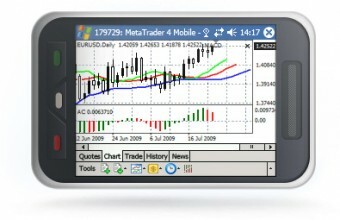 Charts can be zoomed in or out of using the pinch-and-zoom technique, allowing you to easily identify trends, and the whole interface has been designed from the ground up to be easy to use on small touchscreens. The leading Swiss forex broker, Dukascopy, have made a version of their trading platform for smartphones that replicates the majority of the features of their desktop and web apps. Key features include instant order execution, a wide range of trade orders, access to trading reports, and a set of FX tools that includes market news, economic calendars, pivot point levels, daily highs and lows, and Dukascopy TV. While it is available for both iOS and Android, the Android version lacks a couple of features such as multi-language support and market alerts, but apart from that it is just as impressive. Having been among the first brokers to launch a smartphone version of their trading platform, OANDA have had more time than any other broker to evolve their mobile apps – and it shows. This offers the full functionality of their web-trading platform in a way that is much easier to navigate on a small smartphone screen, including tick-by-tick quotes, charting, order limits, updated account balances, and the ability to execute a full range of trade orders wherever you are. This Apple-endorsed trading app, which is available in return for a monthly subscription of $7.95, provides users with access to up to three broker accounts, including real and demo accounts. All the basic functions of most trading platforms are available, including the ability to open and close positions, execute trade entry and exit orders, modify existing positions, and view trading history. 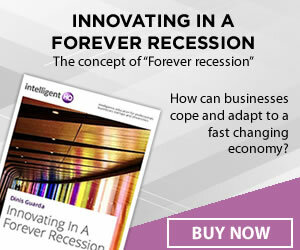 It also features the ability to view price data in a number of different ways, with advanced charting capabilities, and it also comes with economic calendars and rates. While there is an iTradeMobile alerts app available for the Android, it’s not particularly useful, and if you have iOS and Android devices running side-by-side, you might be better with an app that is available in full for both platforms. This news app from leading financial news agency Dow Jones provides a live stream of breaking markets and business news headlines, stories, and real-time commentary over the course of the trading day. Perhaps the most innovative feature is the text-to-speech function, which is available for the top stories, and in combination with the podcasts can provide a hands-free way to absorb the latest market news. It also offers a customisable watchlist to enable you to keep track of news stories affecting currencies that you have a specific interest in, the ability to look-up quotes instantly by name or symbol, charts, and clickable quote data at the end of each article. This suite of forex market tools could form an essential part of any trader’s mobile armory, especially those that are interested in trading minor and exotic currency pairs. It offers up-to-the-second exchange rates for over 160 currencies, with charts across a range of time frames ranging from one day to five years. Other useful functions include real-time streaming currency charts for selected currency pairs, a currency quiz, forex market news and commentary, and one of the best quick currency converters around – which is also available for other formats including iOS and Blackberry. Danish investment bank Saxo are well-known for their software development skills, having provided white-label trading solutions to many other brokerages, banks, and service providers. The mobile version of their SaxoTrader software is one of the best and most comprehensive smartphone trading solutions out there, with comprehensive charting facilities, an exclusive news feed, and a full range of trade order functionality across a wide range of asset classes. This free, multi-broker app allows you to keep track of everything that is going on in the market, with real-time quotes from various brokers allowing you to compare spreads, and a live chart feed showing you what is going on in the market at any given time. Basically, this offers many of the same features as broker-specific mobile trading platforms without being tied to any particular one, so if you have more than one trading account, this app is the perfect solution for managing them when you are on the move, without the need to switch between apps or take up unnecessary space on your phone’s internal memory.